The Galaxy S9 Is An S8 With Updated Cameras, Dolby Atmos & Ergonomically Placed Fingerprint Scanner - AndroGuider | One Stop For The Techy You! After the flurry of leaks, there was almost nothing left to be known about the Galaxy S9 and S9+. Nevertheless, the two phones are now official. The highlight of the S9 and the S9+ are the cameras. Advertisement hoardings for the S9 being put at the MWC consist of the tagline - "The Camera. Reimagined." The Galaxy S9 features a mechanically adjustable aperture. The S9's adjustable aperture can be understood similar to as the human eye's pupil. In a dark room, the size of the pupil increases to let more light into the eye and in bright scenes, the size of the pupil shrinks to let in only the required amount of light. The aperture size decides how much light is let into the camera sensor. The Galaxy S9's camera lens can make use of two aperture sizes - f/1.5 and f/2.4. In low light situations, the camera lens adjusts the aperture size to f/1.5, while in bright situations, such as a sunny day, the camera lens makes use of the f/2.4 aperture. 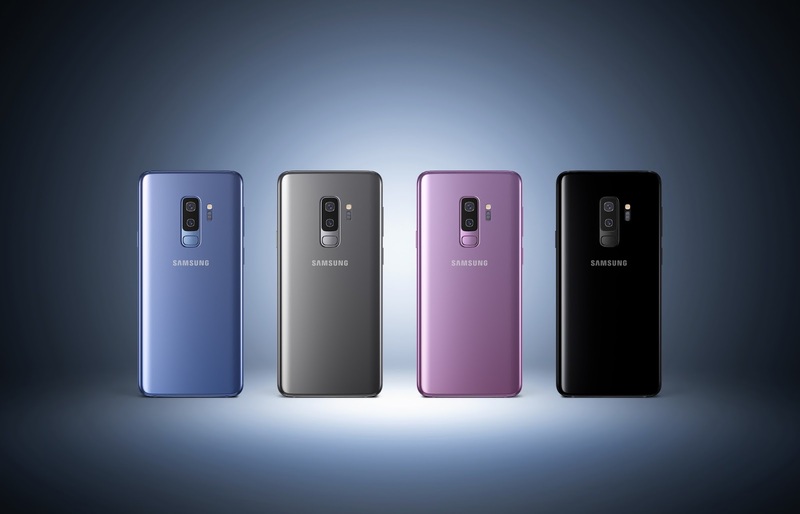 The camera will automatically shift between the two apertures depending upon the lighting; however Samsung has also included a "pro" mode in the camera application for those who would manually like to adjust the aperture. The Oppo N1 was the first smartphone to feature a rotating camera module. What this means is that there was only one camera lens located at the top of the phone and the camera module could be rotated to act as either the selfie or rear camera. While this technology didn't setup a trend of rotatable cameras, this was something new in itself. Since this is the first time we are seeing variable aperture in a flagship smartphone, I was skeptical about the lifespan of the adjustable aperture lens. Oppo stated that the camera module in the N1 can handle at least 100,000 rotations, however Samsung haven't put any number on how many times the camera lens can change its aperture. But given that a reputable manufacturer like Samsung is including this technology in their flagship product, it only makes sense that they would have thought this through and looked at the longevity aspect. The Galaxy S9 has a single rear lens and the S9+ has two of them for pulling off portrait shots. The second lens on the S9+ has a fixed aperture of f/2.4. The remaining features Samsung boasted of in the camera department include slow motion video at 960fps (at a resolution of 720p), AR emojis - which are quite similar to iPhone X's Animoji and live translation. 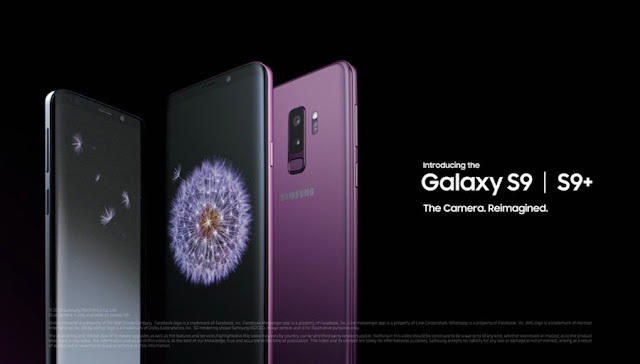 As showcased in the "introduction" video above, once you point the S9's camera to a text in foreign language, the phone will translate the text in the span of a few seconds. Like the S8 and the S8+, the S9 siblings have the same screen sizes (S9 - 5.8" and S9+ - 6.2"), Infinity Display, IP68 dust and water resistance, headphone jack and support for microSD. Samsung has taken feedback of the tough-to-reach fingerprint scanner in the S8 and has now placed it at a reachable spot - below the camera setup. The S9 and S9+ also include AKG tuned dual speakers with support for Dolby Atmos. Samsung claims that the speakers on the S9 are 40% louder than the predecessor and are the loudest on any Galaxy smartphone till date. The specifications for both the devices are given in the infographic above The GS9 and GS9+ are powered by Oreo 8.0 and support for Project Treble has been confirmed on both the devices. Project Treble was introduced by Google to make it easier for device manufacturers to update their devices, thereby motivating the manufacturer to support the device for longer periods of time with software updates. Samsung hasn't stated for how long it will be supporting the two phones. The pre-orders for the two smartphones can be made on the Samsung e-store with a down payment of Rs 2,000. 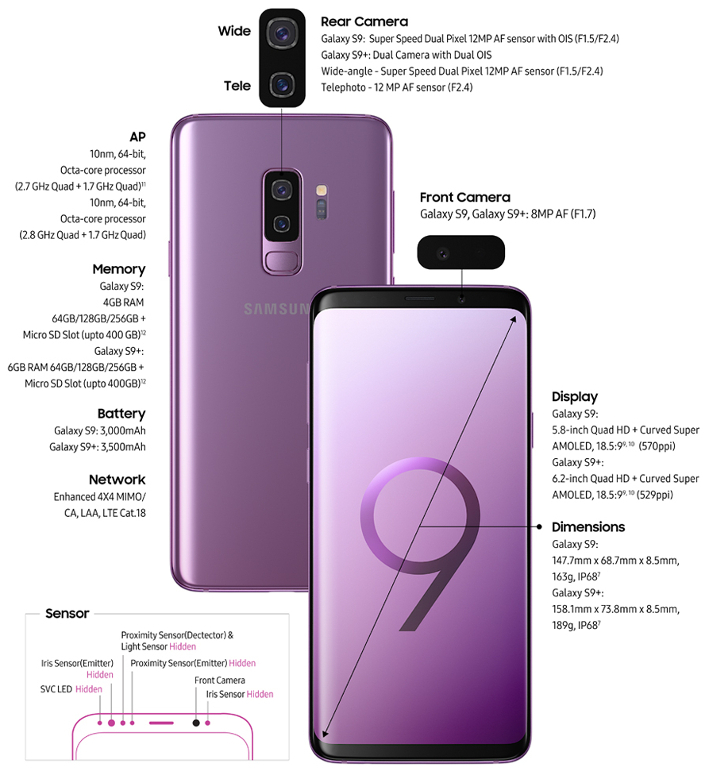 According to an image released by a Redditor, the S9 will start at a price of Rs 62,500, while the base model of the S9+ will cost Rs 70,000. Samsung is yet to announce the official prices for the two devices. In addition to the Samsung e-store, the smartphones will be sold online on Flipkart. In the United States, the base models of the unlocked S9 and S9+ will be sold at $719.99 and $839.99 respectively. Consumers in the United States can only get the black, purple and blue colored models, while residents of other countries will be able to get their hands on a grey model too.